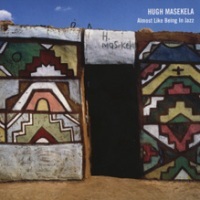 Description: This premier release from the newly formed audiophile recording label "Straight Ahead Records" features Hugh Masekela on flugelhorn. Shunned by some jazz critics earlier, Masekela kept a "safe distance" from straight ahead jazz for a long time, but he always had a strong desire to make a jazz record with his long-time buddy and pianist, Larry Willis. Decades after they first talked about it, they finally went into the Bernie Grundman's studios in October 2004 to make it happen. With a selection of standards, all played as slow ballads, Masekela shows his sensitive and lyrical side. The sound is truly amazing. Everthing from Masekela's warm flugel horn to Willis's piano and drummer Lorca Heart's cymbal strokes is captured with astonishing detail and presence. Captured by a pair of stereo ribbon microphones, you can actually "hear" Masekela's horn moving sideways. The CD side sounds great, but if you have a DVD-Audio player or even a simple DVD-Video player, the 96/24 DVD side will provided a smoother, more analog-like sound. Produced by Stewart Levine; Recorded at Bernie Grundman's Mastering Studio in October, 2004; Recorded and mixed "live to two track" by Scott Sedillo using equipment designed and built by Beno May. This Dual Disc contains CD quality audio on one side and high resolution 96kHz/24-bit DVD audio on the flip side. It plays on any CD player, DVD-Video and/or DVD-Audio player.